Do Brazilian bail bondsmen accept payment in gold medals? 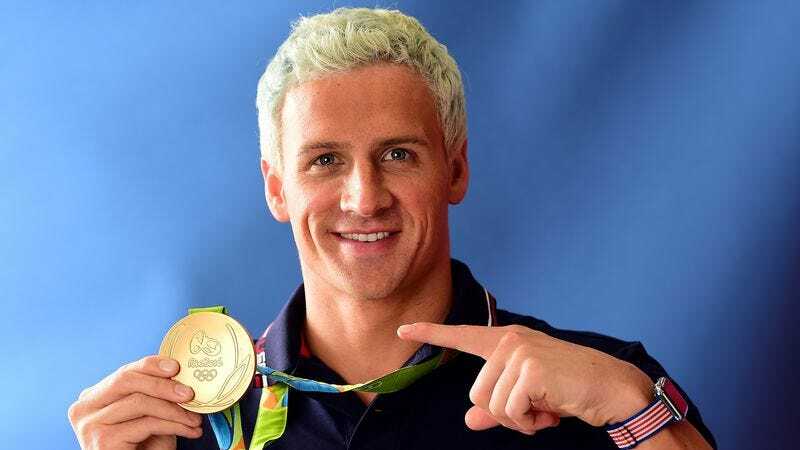 Olympic swimming champion Ryan Lochte may be about to find out, as The Associated Press reports that the 12-time medal winner has been charged by Rio police with filing a false robbery report. That’s after it was revealed that Lochte’s Speedo was most definitely on fire when he claimed to have been robbed at gunpoint with three of his teammates while attending the Summer Olympics in Rio, a figure of speech that may or may not have affected the swimwear company’s decision to drop him as a spokesperson a few days later. Lochte is currently in the U.S., where he’s been informed of the charges and can decide whether or not to introduce a defense in Brazil. The charges will also be introduced to the International Olympic Committee’s ethics commission. According to The Chicago Tribune, Brazilian law sets the maximum penalty for filing a false police report at 18 months in prison. It’ll be up to U.S. authorities to decide if Lochte will be extradited and forced to stand trial, although he could be tried in absentia if that doesn’t happen. Either way, we’re sure authorities will treat Lochte with the same impartiality and respect for the rule of law as any other suspect, unaffected by his status as a celebrity sports hero.